Photo by LORETTA JACKSON Volunteers Patti Bookless, left, of Hampstead, and fellow guild member Faye Tresvik, of Amherst, prepare to greet visitors to the Amoskeag Quilters Guild biennial quilt show, an event held at Manchester Memorial High School  a venue that accommodated over the course of a weekend hundreds of quilting enthusiasts. Photo by LORETTA JACKSON Bette Belanger, background, of Amherst, the owner of Quilting a Way to a Pieceful Life, an Amherst business that was represented along with many other vendors at the 15th biennial show recently hosted by the Amoskeag Quilters Guild, wraps a newly purchased craft kit for patron Kathryn Fleming, a longtime quilter from Merrimack. Photo by LORETTA JACKSON Merrimacks Terry Burris, owner of Terry Burris Quilting Services, displays one of her show entries, Spring Bouquet, a quilted work of art that took awards at the Amoskeag Quilters Guild show, an event that drew 170 entries and included demonstrations, vendors and raffle prizes, including a grand prize of an intricately worked quilt rendered collaboratively by numerous guild members and completed with longarm quilting by Terry Burris Quilting Services on behalf of beneficiary St. Joseph Community Services. Photo by LORETTA JACKSON Carrie Cahill Mulligan, a vendor at the Amoskeag Quilters Guild quilt show, displays some of her heirloom-quality handknit hats, felted creations that are lavishly embroidered and knitted from 50 percent llama wool, a fiber reputed to be eight times warmer than the wool from sheep. Photo by LORETTA JACKSON Amoskeag Quilters Guild member Paula Warren, of Amherst, volunteers to take a turn at the sales table where scores of show attendees bought raffle tickets and added their entries for the grand prize raffle of a member-made quilt, displayed in the background, whose sales benefited Saint Joseph Community Services with 100 percent of the proceeds of the raffle. 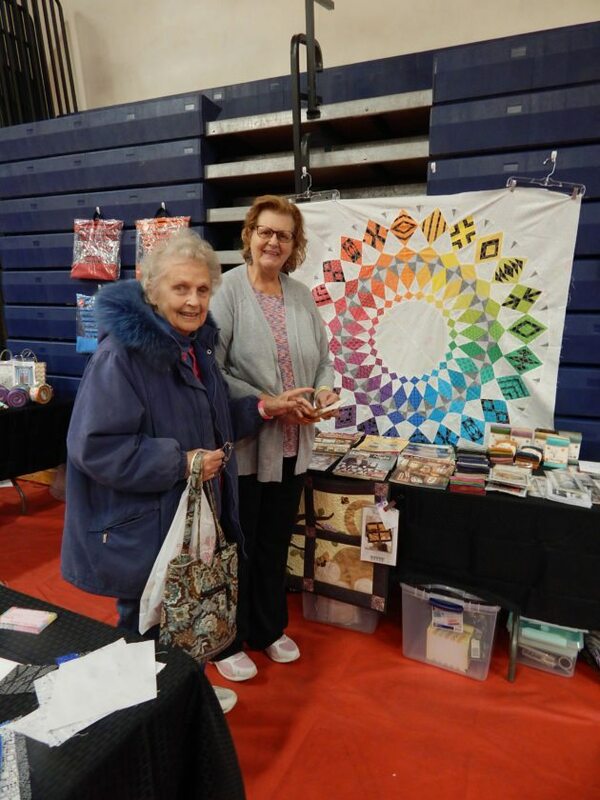 Quilts of all colors in a myriad of patterns triggered rapture in hundreds of admirers at the 15th biennial quilt show hosted by the Amoskeag Quilters Guild, an association of more than 200 quilting enthusiasts from towns throughout the region. Guild members hosted the show on Saturday and Sunday, March 24-25, at Manchester Memorial High School on Crusader Way. The public ogled 170 quilted works of art. Some were super-sized for beds that well might accommodate the royal family, en masse. Others were smaller. 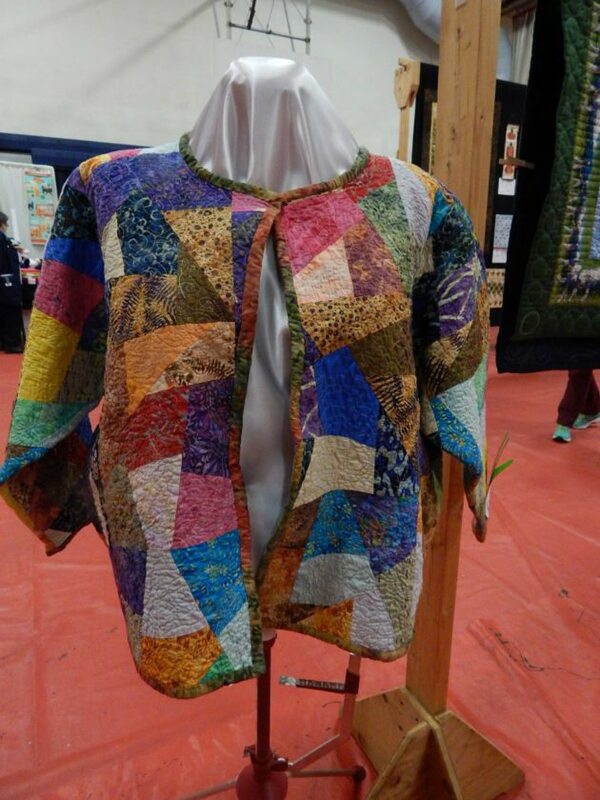 Wall hangings and table runners vied for honors, as did a woman’s jacket constructed in vivid colors by novice quilter Donna Watkins, of Manchester. Bette Belanger, of Amherst, a quilter since her mom taught her the craft at the age of 10 has been a quilting teacher for 30 years. 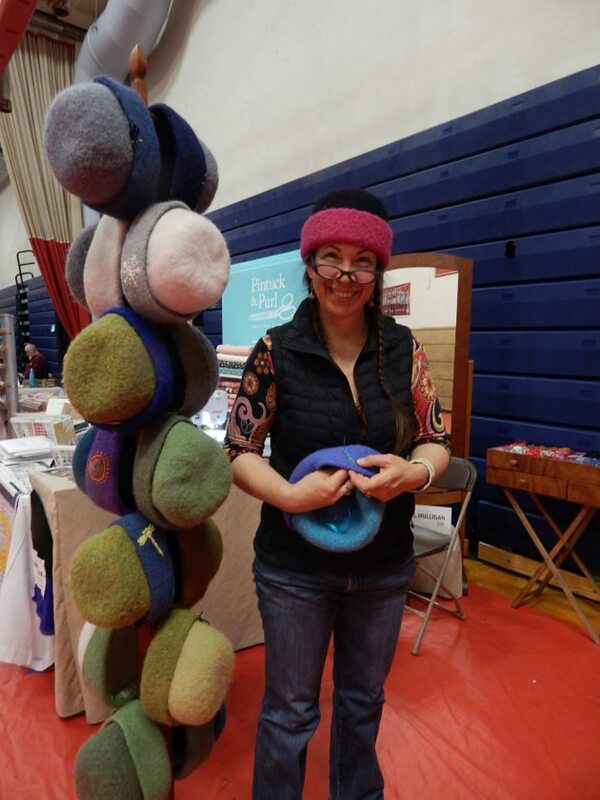 She attended the show as one of nearly 20 vendors whose wares and services ranged from hand-turned, woodworked writing pens to swathes of fine fabric, quilted toys and on-site embroidery. Belanger, owner of Quilting Away to a Pieceful Life in Amherst, offers a wide variety of quilting products and instruction in the art, an activity originating in ancient Egypt. Her longarm quilting machine, a device whose extended arm can apply quilting stitches to the largest of quilts, is regularly commissioned by her students. The machine is a convenience in sandwiching a quilted front piece and a back piece to a middle layer of fluffy batting. 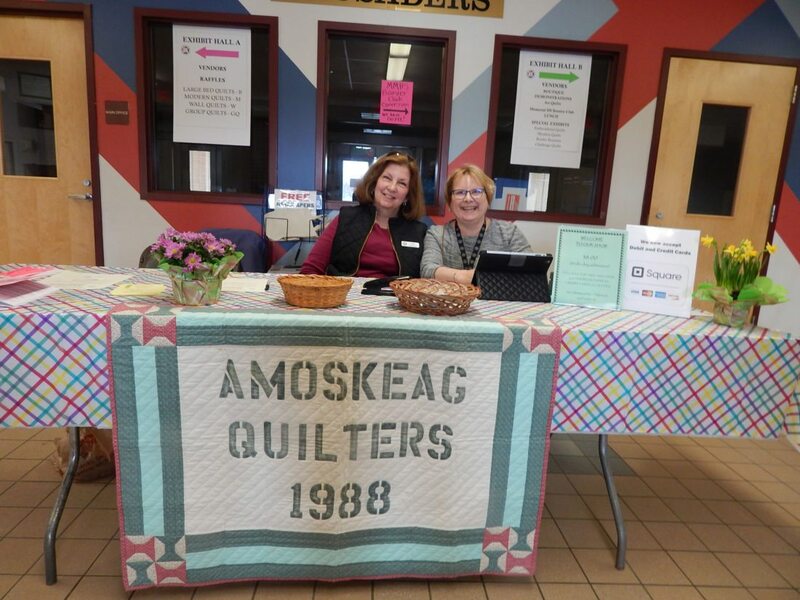 The non-profit Amoskeag Quilters Guild, founded in 1988, is an association whose members meet monthly on the third Thursday of the month, September through May, at Emmanuel Baptist Church in Hooksett. The group’s quilt shows are biennial to give everyone ample time to construct the labors of love that are so labor intensive. Dennis Duggan, of Merrimack, the guild’s historian, has been quilting for seven years. He captured ample photos to document the event, one that featured demonstrations of quilting techniques and a raffle of around 50 beautifully wrapped gift baskets. Another raffle drew scores of entries. The prize was an Elna 3230 electronic sewing machine valued at more than $600. Linda Leszcynski, a Merrimack resident, was the lucky guild member who won the prize. Other contenders who had gathered around the state-of-the-art sewing machine delivered a collective sad sigh then stepped away to another table where an even more lavish raffle prize was about to be awarded. The grand prize of the show was an intricately worked quilt named, “Virginia Bound,” a Bonnie Hunter design that was completed since the last show by a team of guild members and quilted by Terry Burris Quilting Services, of Merrimack. A member-selected charity receives 100 percent of the proceeds from the grand prize. The beneficiary of the grand prize funds was St. Joseph Community Services, Inc., provider of “Meals on Wheels,” an organization that since 1977 has delivered more than 12 million meals to neighbors in need. The SJCS also offers community dining at various senior centers and other sites where folks gather for a nutritious lunch and some social chit-chat. The grand prize quilt was won by Carol McCarthy, of Pelham, whose ticket was entered by Pat Bannister, a resident of Londonderry and a guild member since the late 1980s. Meghan Brady, SJCS president of the Merrimack-based nonprofit, was on hand to draw the ticket and thank all who participated. 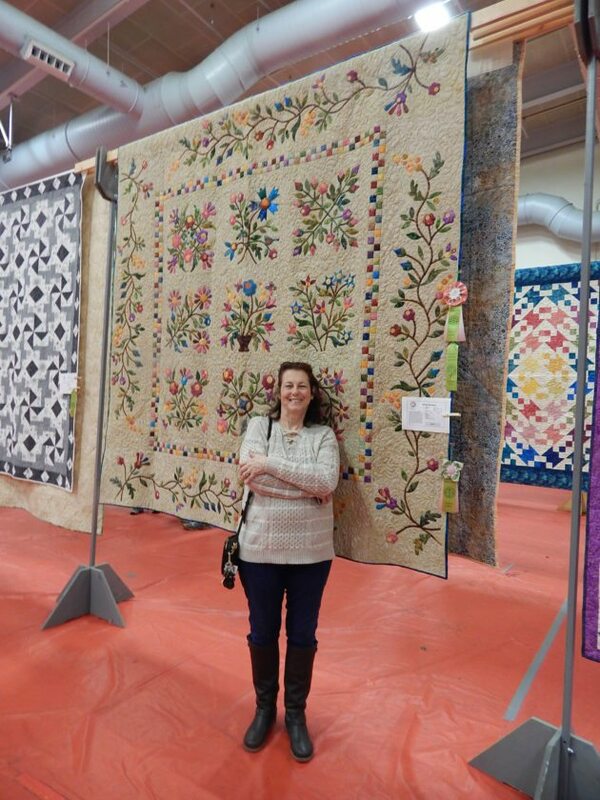 Cathy Bowen and Denise McKinnon, quilt show co-chairs, noted in the 15th biennial show program that the creations on exhibit were “tomorrow’s heirlooms.” Judy Corbit, guild president 2016-2018 and a member for some 14 years, added her sentiments. She noted there that funds raised from the gift basket raffles are donated to The New England Quilt Museum in Lowell, Massachusetts, to help support the heritage of quilting from colonial times to the present.